The upcoming titles that Japanese developer Imageepoch says will revive the JRPG are going global. Imageepoch recently unveiled a new RPG publishing venture that the company says will put the JRPG back into the world's good graces, but didn't confirm that it would be releasing any of its upcoming titles in North America or Europe. Thanks to an interview with Dengeki Online, Imageepoch has confirmed that its new JRPGs will indeed be coming overseas. At a recent press conference, Imageepoch announced Final Promise Story, Black Rock Shooter: The Game, Chevalier Saga Tactics, and no less than five future projects including a collaboration with Sega. Dengeki asked Imageepoch CEO Ryoei Mikage if he planned to bring these games to regions other than Japan, and he said yes. Imageepoch has decided to team-up with Nippon Ichi Software America (NISA) to release these and future titles in North America and Europe. 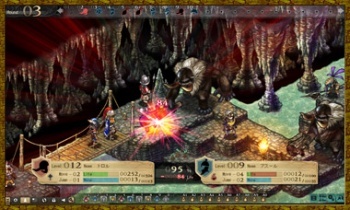 NISA is known for various RPG series such as Disgaea and the Atelier games. Mikage chose NISA because of its success with Disgaea, which has sold 150,000-200,000 units in North America. There wasn't any information given on release dates or which titles will make it overseas first, but Final Promise Story isn't hitting Japan until April 28, 2011, so there could be a solid wait until we get our hands on what Imageepoch has cooked up. The idea behind Imageepoch's "JRPG" publishing label is to convince gamers that the JRPG can break out of its conventions that they might be finding a bit old by this point, such as sometimes tedious random battling. There have been plenty of good RPGs to come out of Japan recently, but there's no denying that the JRPG is associated with a negative stigma it once wasn't. I'm glad these new "JRPG" games are coming overseas, but I just hope they'll be able to find an audience. Final Promise Story and Black Rock Shooter are both for the PSP, which by next summer could be overtaken by a new Sony handheld. If they don't, Imageepoch at least still has the PS3/PC's Chevalier Saga Tactics and four mystery titles which NISA can handle in the future.